(CNS): Some six weeks after the trial of Keith Orrett, Brian Borden, Bjorn Ebanks and Keith Montaque for possession of unlicensed firearms was adjourned owing to a combination of delays caused over jury problems and issues relating to both the crown and the defence cases, Trisha Hutchinson finally presented the prosecution’s case on Monday morning (12 April). 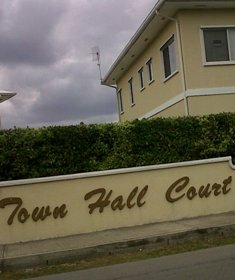 The jury of only six – four women and two men — finally heard the details of the crown’s case that the men were at a house in Town Hall Court, West Bay, when police found two unlicensed loaded shotguns on the afternoon of 7 April 2008. In her opening statement Hutchinson pointed out that there were six men present at the time of the police operation, which involved uniform support, the canine unit, CID and officers from West Bay. A warrant was executed at the premises by the police. On their arrival four men were removed from the downstairs of the property and later arrested, while two other men were found apparently sleeping in an upstairs bedroom and were also removed and arrested. Hutchinson told the jury that the men were guilty of the crime of possession of unlicensed firearms as a result of both being present and because their DNA profiles were found on the weapons. Although six men were present at the property on the day of the operation, the court learned during the course of the first day’s testimony and cross examination that two of those men were not charged in the case. With the trial underway, two of the police officers were called to the witness stand and explained that the police had gone to the property as part of a specific investigation. When they were there and following a thorough search of the house with the help of specially trained dogs, the police entered the attic and Sergeant Joseph Wright found the weapons wrapped in clean white towels in what was described as a very dirty and dusty attic. The trial continues tomorrow morning when the crown will present further police witnesses before DNA experts are called later in the week. The Grand Court trial is being heard by Justice Charles Quinn.